Ask Xoce! You know you want to. Re: Ask Xoce! You know you want to. On the other hand, Aishu (Aishwarya Rai) is such a sweetheart, intelligent, educated, cultured, multilingual, and her parents were strict with her and she was obedient to her parents and she is GORGEOUS and BEAUTIFUL, married to a handsome man. But anyway, she is who I like. yes you are right about Aishu,its true.. i know it since our native places are the same. Have you seen any of her movies? Yes, most recently I saw Umrao Jaan. I did enjoy its beautiful cinematography and of course Aishwarya is absolutely stunning. Do you like any Japanese cartoons? I do. My favorite growing up was Mysterious Cities of Gold. I also like some other series. I liked Nausicaa, Kiki's Delivery Service, Grave of the Fireflies, Mononoke Hime, My Neighbor Totoro, and all other Miyazaki stuff I've seen. I also like Fushigi Yuugi, Magic Knights Rayearth, Gankutsuou, Vampire Hunter D (original is better), Hellsing, Trinity Blood, Kimi Ga Nozomu Eien, Tenchi, Trigun, Wolf's Rain, Spice and Wolf, Inu Yasha, Dragon Half, Those Who Hunt Elves, Belle and Sebastian, and probably others I can't remember right now. I love Tottoro! What memories. Of course, Miyazaki is a genius. Have you seen Spirited Away? It was kind of a big hit even in the US fairly recently. You have seen more than I have, that is for sure. 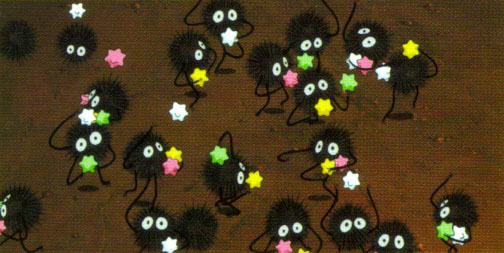 My favorite character(s) in Spirited Away were the little coal-helpers. SOOOOOOOOOOOO Cute!!! Oh yes I loved the dragon the best. I think his name was Haku. Yeah, he was quite the hero. I didn't like him as much, but that's another story. Xoce what's the issue that JTF talks about that's most important to you? getting it right when it comes to muzzterrorists. At this rate I will never get to 1,000 posts. What are some of your favorite topics? Thank you, AH. Can I have your favorite recipe? I wish Chaim could share more stories from the past but I understand why he can't. I always find those to be especially fascinating too. He's lived an amazing life and had lots of great accomplishments for his people. Xoce I would like to ask what is your favorite type of animal. Ok, how about the dish that you cook most often. Just pick one. Good question. I like dogs. They are loyal, smart, loving, and good. I like other animals, too, but wouldn't really know what I'd do if I had a pet dolphin or something. I would like a dog, an outside dog. Animals don't belong in the house in my opinion. They should be allowed to roam free. At one of my residences I have a dog that gets to do that, free to hunt and play across miles and miles. Boil potatoes without peeling, then remove skins and mash, as you would make mashed potatoes. After potatoes are mashed return to hot pan briefly and shake over low heat to dry them slightly for a minute or two. Combine flour, egg yolk, and Parmesan cheese. In a pan, sauté the garlic clove in a little olive oil, until lightly golden brown, then add sliced spring onions, tiger pawns in little pieces, and after a few minutes, tomato sauce. Season with salt, pepper, and chives. Boil the dumplings for 3 minutes and simmer in the sauce before serving. Have your butcher butterfly the steak to a 1 inch thickness. Season steak on both sides with cracked black pepper and sea salt. Place steak and onions in a ziploc bag or stainless steel pan and pour over enough wine to almost cover; cover, chill, and marinate overnight. Remove meat from marinade. Sprinkle with garlic powder and grill over hot charcoal to desired doneness. Heat the marinating onions in wine. Bring to a boil, reduce heat and simmer for 10 minutes with parsley, and crushed garlic. Remove from heat and stir in butter. Serve steak topped with onions and drizzled with sauce. I love almost anything with potatoes or bread. I'm so glad to see that recipe with the potatoes that you posted here in Xoce's thread. Why haven't you been active in a long time. I don't think that she will answer. We are giants, giants in love...and if you ask that who are we, then you must be a dwarf.